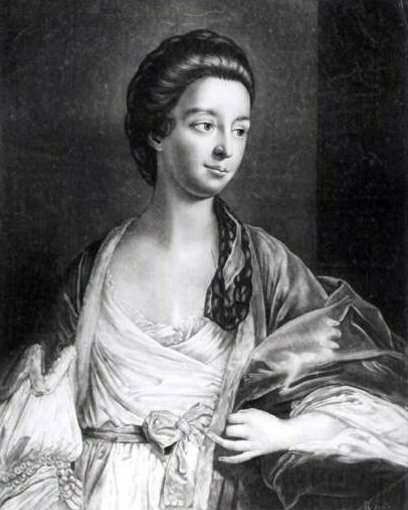 Elizabeth Chudleigh was born on March 8, 1721 into an old Devonshire family who owned property but was neither rich nor titled. After her father died, her mother moved the family to May Fair, a then-new section of London, and took in a lady lodger to pay the bills. Not much is known about Elizabeth’s life before she was appointed, thanks to her beauty and one of her mother’s friends, as a Maid of Honour to the Princess Augusta of Wales in 1743, at the age of 22. Elizabeth soon attracted men’s attention and among her admirers there were several lords. Elizabeth fell for Augustus Harvey and after a very short courtship, he proposed. They barely knew each other. The marriage was celebrated at night, in secret, with only a few witnesses present, and quickly consummated as the groom had to leave the next morning for his naval duties. Her husband gone, Elizabeth realised she had made a mistake. Now that she was married, she would have to give up her position as Maid of Honour and, although she earned only 200 pounds a year, which was barely enough for her glamourous lifestyle, it was money she badly needed. Her husband’s salary was even lower: only 50 pounds a year. So, she decided not to reveal her new status. She even managed to give birth to a baby, who soon died, without attracting much attention,although, at this time, rumours started to circulate. She then started to avoid any communication with her husband, and the two soon grew apart and so hostile that they simply pretended they had never been married. There were only a few witnesses, and no paperwork, to prove the marriage had taken place anyway. Elizabeth simply carried on her life at court as normal, taking part in balls and masquerades. At one masquerade, she shocked everyone by turning up as “Iphigenia ready for the sacrifice.” Although we don’t know exactly what her costume looked like, it must have been pretty risqué as a guest commented she was “so naked ye high Priest might easily inspect ye Entrails of ye Victim”. 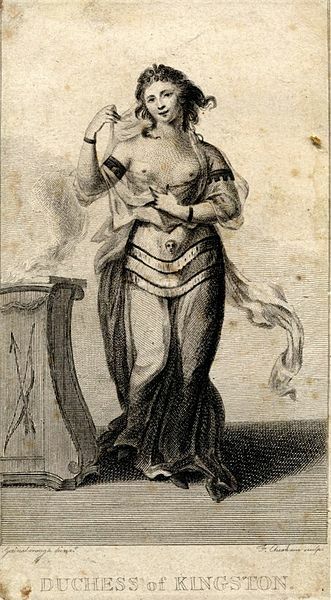 It seems that at least one of her breasts was exposed as the King, George II, asked her if he could touch it! Undaunted, Elizabeth took his hand and replied, “Your Majesty, I can put it on a far softer place,” and placed it on his head! The King was delighted, but from that moment on, the other Maids of Honour ostracized her, refusing even to speak to her. Elizabeth also started an affair with Evelyn Pierrepon, Duke of Kingston-upon Hull, whom she truly loved. In the meantime, Harvey had become next in line as Lord of Bristol. When Elizabeth heard this, she decided to have her marriage to Hervey registered in the parish church at Lainton. She was probably looking for security in case the Duke deserted her, but it was a decision she would regret bitterly in the near future. In the meantime, Hervey had settled in England and decided he wanted a divorce. Elizabeth could finally have gotten rid of an unwanted husband, but, probably fearing the Duke wouldn’t marry a divorcee, told the ecclesiastical court her marriage to Harvey had never taken place and so, they couldn’t be divorced. The court ruled in her favour and within a month, she became the Duchess of Kingstone. But even though the court had declared her a spinster, and thus free to get hitched, everyone knew that the she was actually married to both Harvey and the Duke. Good society, both in the city and in the country, shunned her. It seemed that Elizabeth, madly in love with the Duke, didn’t care much and was more than happy to spend her time with him instead. Her marriage was short-lived. The Duke died only 4 years later. Elizabeth was devastated. But her woes weren’t over. The Duke’s relatives were outraged at the terms of his will: Elizabeth would inherit everything, provided she remained a widow, and only after her death, his property would pass to his sister’s second son. So, the Duke’s nephew initiated trial for bigamy against Elizabeth. During this time, she was under house arrest. This was due to her ill-health, otherwise she would probably have ended up in the tower of London. All fashionable society eagerly followed the trial, while the public read all about it in the papers, who portrayed her as a gold digger. This time Elizabeth was found guilty. She lost her title (which however she kept using) but managed to avoid being branded on the thumb, which was the usual punishment for bigamy at the time. She however was allowed to retain her fortune, so the Duke’s family brought in another suit against her to have his will overturned, claiming that at the time of its writing, he had been under Elizabeth’s influence. Warned that the trial could last for years, Elizabeth hastened to leave the country and started travelling throughout Europe. 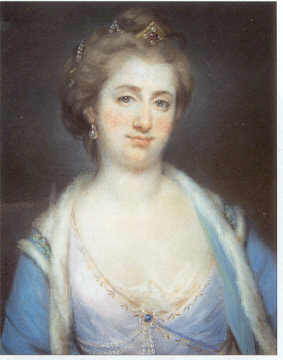 She died in Paris on 26 August 1788.